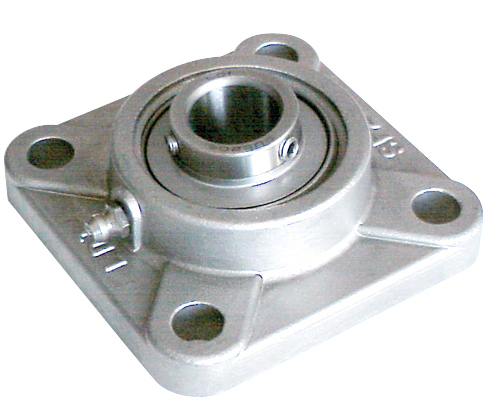 Stainless Steel 4-Bolt Flange mounted units are made of corrosion resistant stainless steel and are ideal for the food handling industry, water treatment plants, and salt water desalinization plants. Balls & Rings are made out of 440 Stainless Steel, Set Screws 410 Stainless Steel, slinger & Seal Frame 302 Stainless Steel, Retainer 302 Stainless Steel, Set Screw locking Collar (SNA only) 304 Stainless Steel, Seal Silicone Rubber Lubrication H-1 Food Grade Grease Operating Temp. Range -10° F to 250° F. Housings are 304 Stainless Steel Stainless steel. They are generally the most effective solution for highly corrosive applications. They do not experience the same flaking, cracking, deformation or discoloration issues associated with other corrosion resistant housing materials. They are virtually unaffected by scrapes and can easily handle significant radial loads.